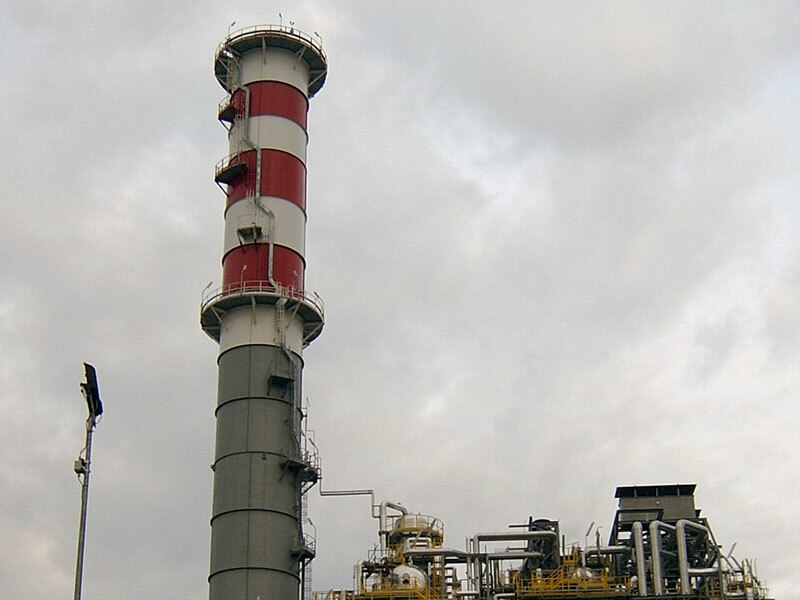 Industrial plants, where boilers and HRSG are used, need an effective degree of sound proofing comparable to their positioning incorporated into their surroundings and/or to EPC specific requirements on this subject. All vents to the atmosphere have to be more or less silenced, depending on venting time. Sometimes also the whole boiler structure has to be sound-proofed, not for the high noise emission in terms of Sound Pressure Level but for the high Sound Power Level due to their big dimension. In other particular cases also auxiliaries have to be sound-proofed because of their local high Sound Pressure Level. 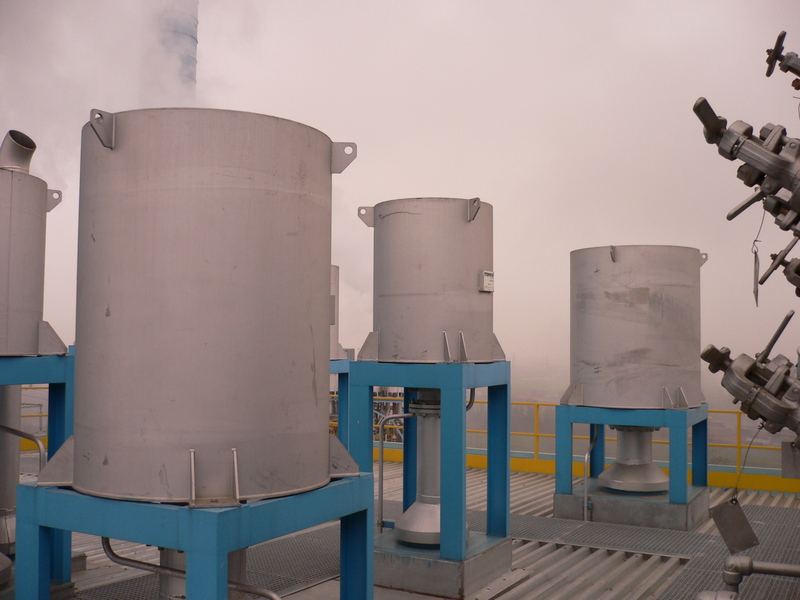 Safety valves, start-up valves, blow down and flash tank recipients when discharge to the atmosphere, they all create a very high noise level that must be silenced through the use of a dedicated and well sized silencer. The wide and long experience of STOPSON ITALIANA in designing and manufacturing these kind of equipment is essential to provide the customer with the right equipment able to guarantee the requested acoustic performance, either in terms of attenuation, residual sound pressure level or emitted sound power level. In addition, our highly qualified engineering team can take care of all relevant aspects related to life-cycle, materials, painting, design and so on, in order to assure the best service and product for each specific client’s application. Go to our Vent Silencers page to learn more about product description. Where a by-pass stack is present, depending on frequency of by-pass operation and proximity to urban areas, etc., it requires insertion of a suitable sound-proofing device. 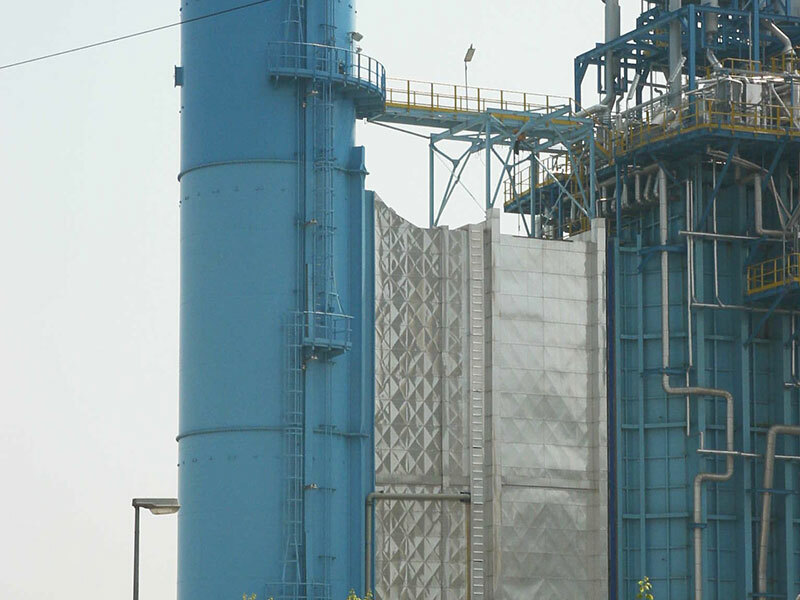 The custom-made, splitter-type cartridge silencer is eventually installed at the top end of the by-pass chimney of the gas turbine exhaust. In order to allow proper operation of the gas turbine, the silencer shall be designed to make sure to withstand flow-dynamics parameters of the existing engine configuration thus limiting to the minimum the impact on pressure losses while reducing noise to the required level. Particular measures on constructive aspects shall be also taken to ensure resistance of the equipment to the strict working conditions. Supporting structures for the splitter silencer must be carefully designed to withstand high operation temperatures in a limited available space and allowable weight with the aim to limit any change to the stack configuration. Our wide engineering experience in designing engines test benches with post-burners can provide a cautious and optimized choice. 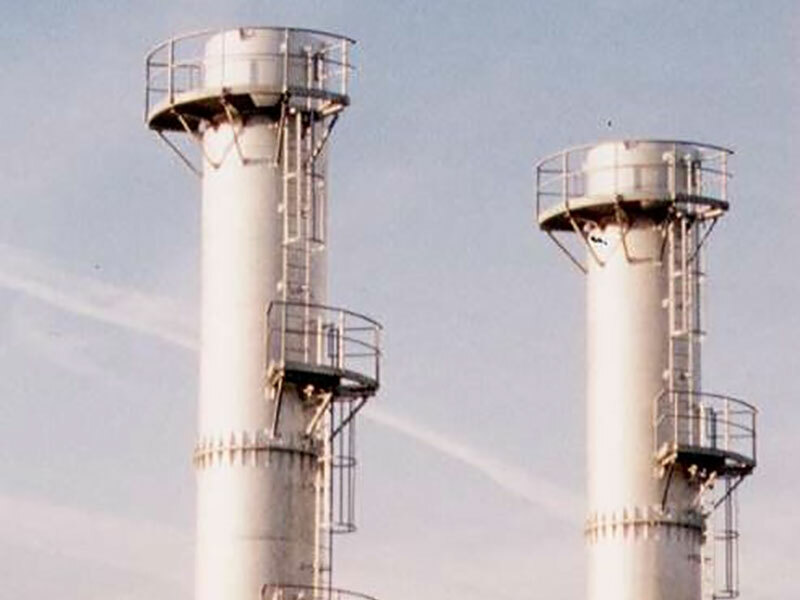 Noise emitted at gas turbine exhaust is not enough lowered by heat recovery boiler in cogeneration plants, it is therefore necessary to add a silencer into the flow in order to reduce residual noise level to an acceptable value compared to plant neighborhood. 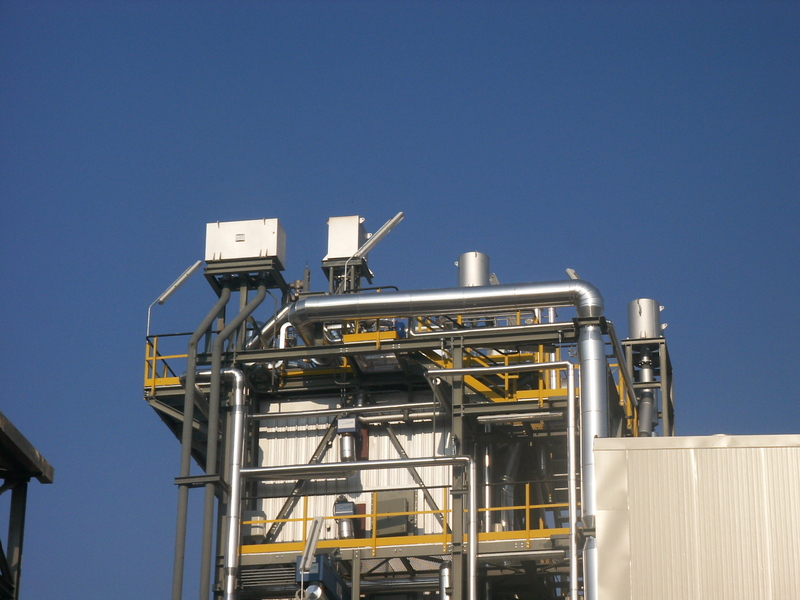 In either vertical or horizontal flow installations, upstream or downstream the boiler, the silencer is designed to provide a wide frequency band attenuation of the sound level, thus the compulsory choice is toward an absorption and direct passage silencer. In order to match acoustics, flow-dynamics and mechanical requirements, a wide experience and competence on design is to be applied to properly manage significant volumetric flows, pressure drops and high temperatures while ensuring performances, resistance and duration. Since exhaust pressure drops are almost completely used for boiler design, large sections are required to withstand the hot gases flow. Therefore, silencing baffles require an accurate evaluation of aerodynamics, stability, mechanical and thermal stresses of each single components, including stiffeners, positioners and brackets. Our engineering capabilities and the use of computational fluid-dynamics tools is the most appropriate answer to provide the most suitable solutions in terms of geometry and materials selection in order to ensure acoustic performances and long life-cycle. Most of industrial and residential installations require heat production, generally in the form of hot water. 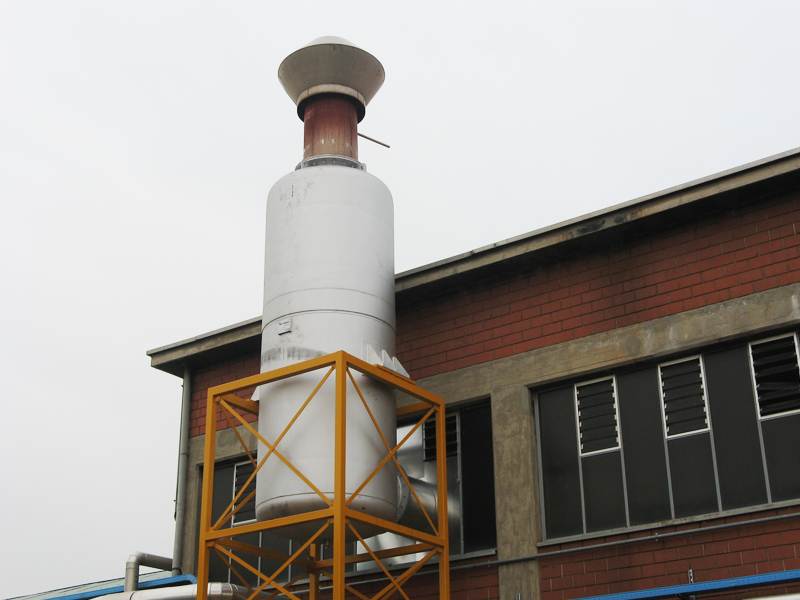 The use of dedicated boilers emitting combustion exhaust into the atmosphere often need application of a special silencer into the chimneys. The combustion-generated noise can increase due to combustion air fan, forced draught - where present - and reasonance effects through the pipe at very low frequencies. 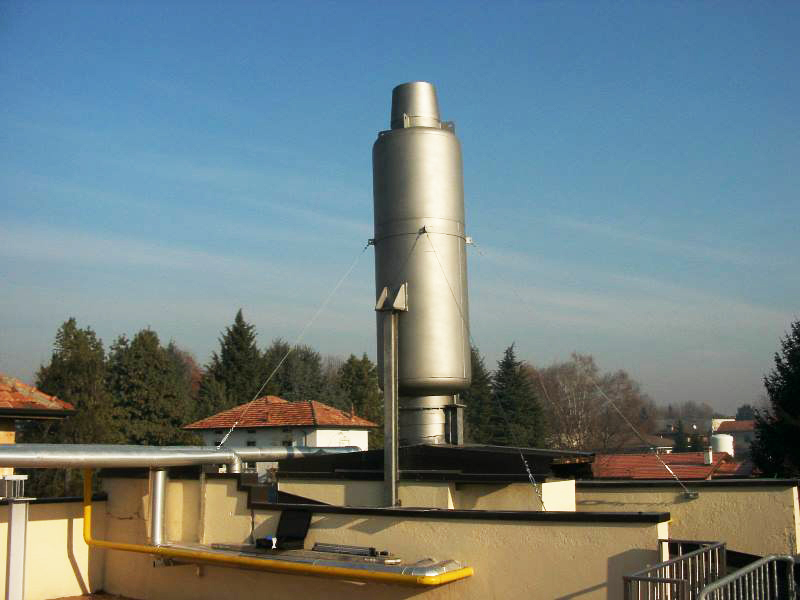 Chimney outlet radiates noise to the environment, which may results in complaints from neighbourhoods. Our solution provides an accurate examination of fluid dynamics conditions, with particular attention to operating temperatures and allowable pressure drops, as well as the acoustics spectrum to identify the most appropriate portion of exhaust pipe to locate the silencer. The frequency range for silencer operation and the limited speed allowed inside the pipe are also driving the correct positioning of the silencer, also requiring the use of CFD simulations when low frequency resonance may happen. 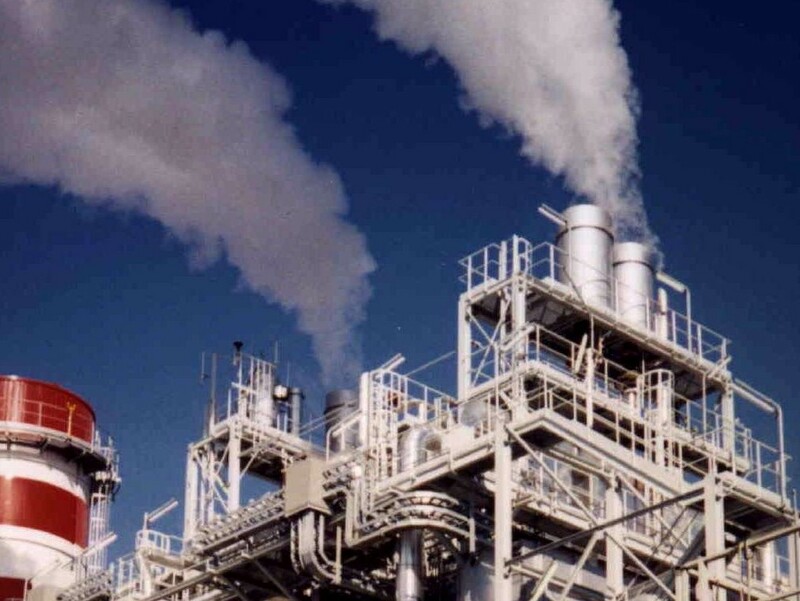 Specifically for diesel-oil boilers applications, possible corrosion issue shall be considered when dew point could be reached: in those cases cheaper absorption and direct passage silencers can be used, whereas in most cases the combined resonance-absorption solution shall be utilized. We will not use this information for any other purpose than contacting you via the mailing list you have signed up for. We will not pass your email address or other details to other companies. You may at any point have your details removed from our database by contacting us. Copyright © 2017 Stopson Italiana. All rights reserved.